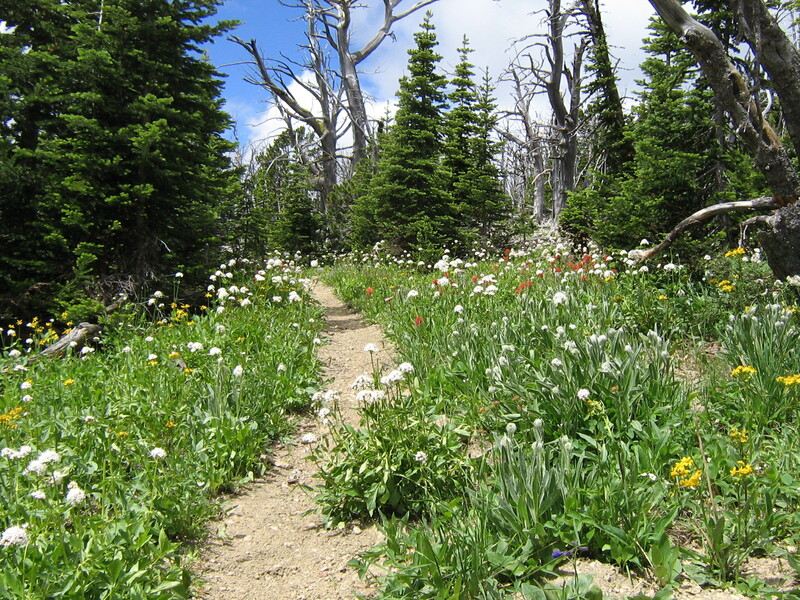 I’m trudging up the steep trail to Curly Lake, thinking – somewhat crabbily – about the Montana Hiking guide’s description of Curly Lake as “not unduly spectacular.” I haven’t been there, and right about now I’m wondering why we chose to backpack to a lake with such a lackluster recommendation. Really? And couldn’t someone add a few switchbacks to this trail? Indeed, after about three miles we walk right by the lake and have to backtrack to find it. It’s not spectacular, that’s true. 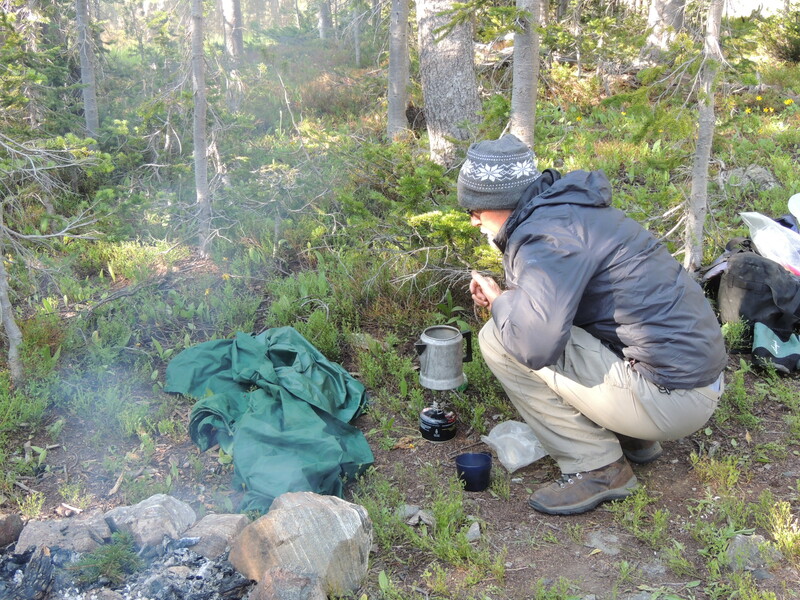 But it’s a lovely peaceful spot in the Tobacco Root Mountains, and would be a great spot for a base camp to explore the surrounding country which is duly spectacular. 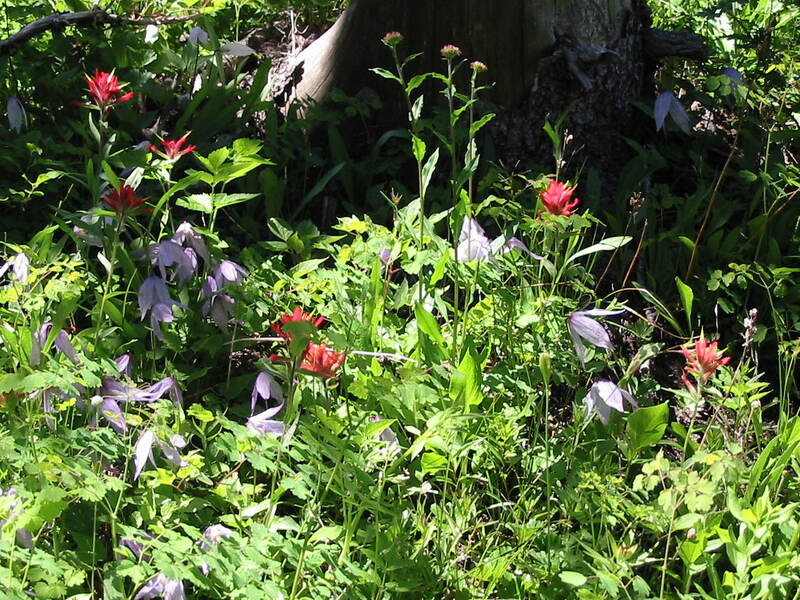 And the trail did level out a bit and started switchbacking, and the wildflowers were most definitely spectacular: Lupine, Indian Paintbrush, Arnica, Harebells, and many more that I don’t know the names of. 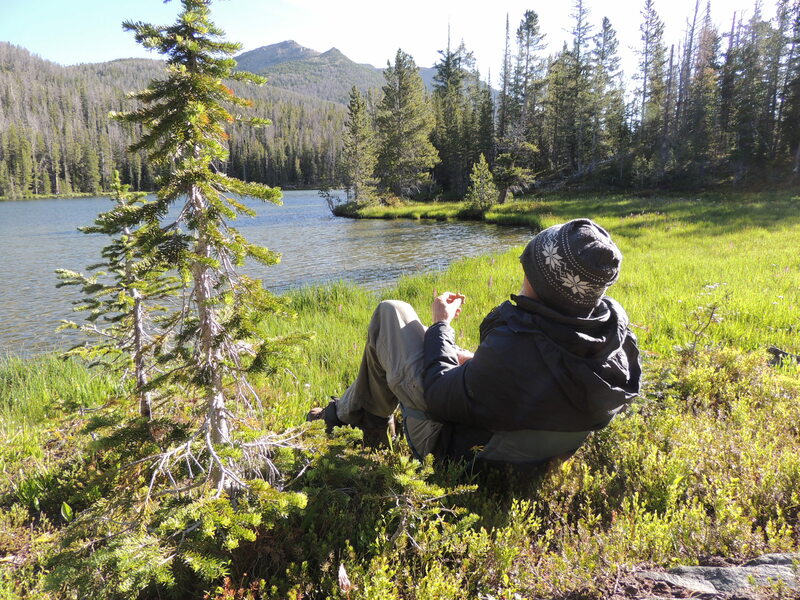 The next morning is cold as well, but it’s delightful sitting on the edge of the calm lake, sipping coffee and listening to the kinglets and sandpipers calling to each other in the morning sunshine. You’re OK, Curly Lake. We all don’t need to be spectacular. 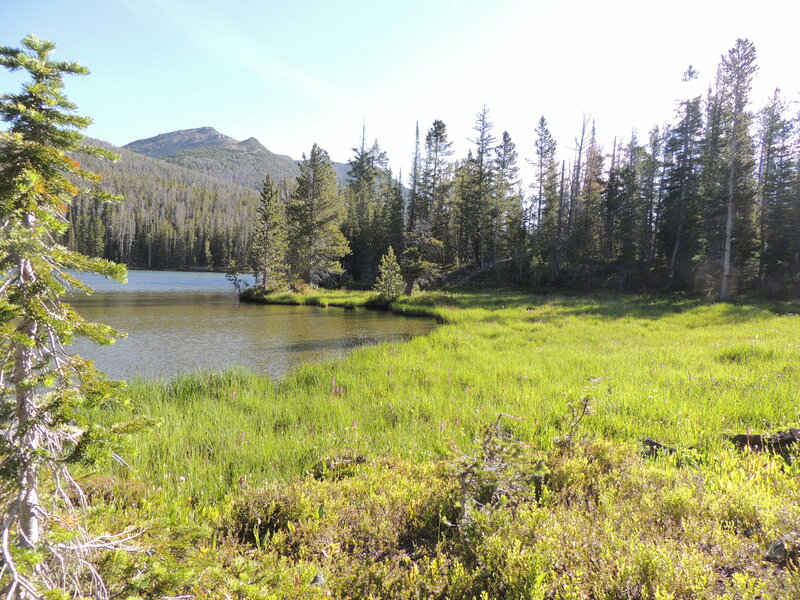 This entry was posted in Backpacking, Hiking, Montana, Nature, Outdoors and tagged Curly Lake Montana, Not Unduly Spectacular Lakes, Tobacco Root Mountains. Bookmark the permalink. 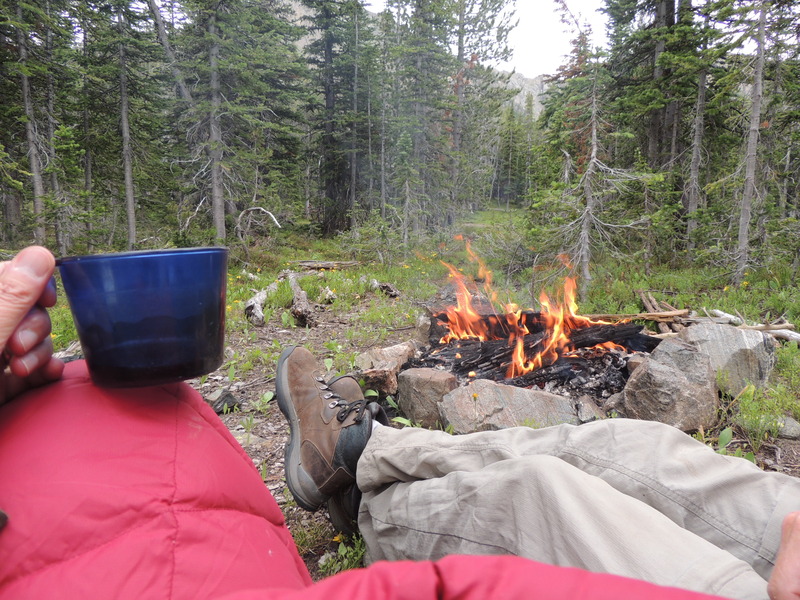 16 Responses to Backpack to the “Not Unduly Spectacular.” Curly Lake, Tobacco Root Mountains. Good point! I was actually thinking about exactly this – that when I was growing up in Massachusetts I would have considered Curly Lake spectacular for sure. It looks moderately spectacular to me. Cheetos, huh? Funny. Yeah, I have no shame. A lovely spot. and your coffee cup enjoyed it too! I think it did! Thanks. Looks pretty good! 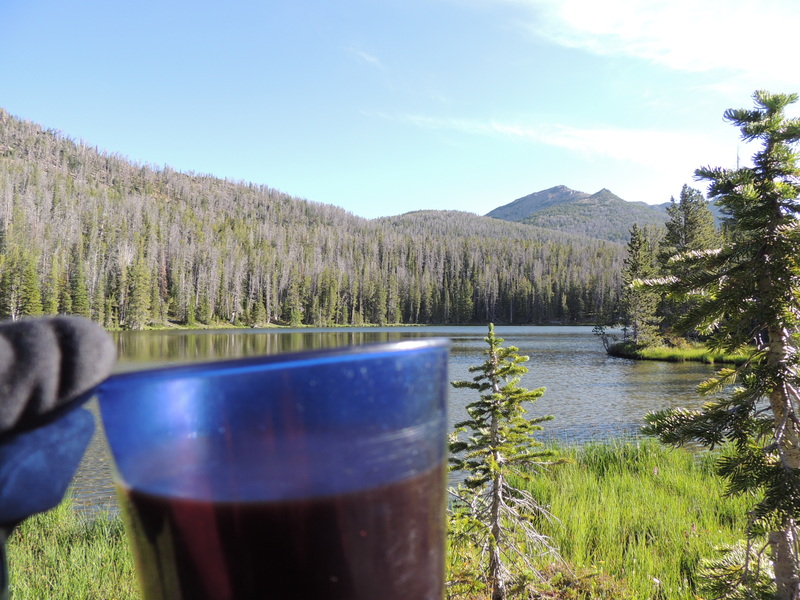 A lake, decent campsite, peace and quiet, and morning coffee…not unduly spectacular works! I guess it does, doesn’t it? Thanks. And it looks like you were the only ones there. We were! That’s always a nice plus. Thanks! I just returned from a five-night backpack, and one of my friends brought along a bag of Cheetos. He made them last all five nights, which I thought was pretty darned impressive. Yep, Curly isn’t that grand of a lake-one you can no doubt walk across without getting your chin wet. The bowl to it’s north however, is spetacular and if hiking to Curly, the Westphal Parks trail (7159) offers better scenery. 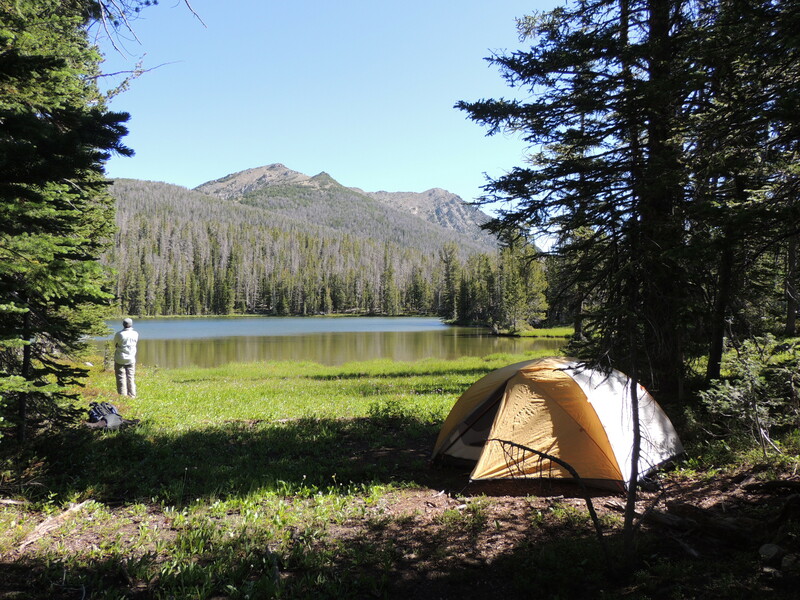 As for camping spots near Curly Lake, keep heading southwest on the trail that branches from 7151 at the upper end of the lake. Less than a quarter mile lies the ruins of a cabin, downhill from which maybe a 100 yards lies a beautiful meadow with a branch of Curly Creek running through it. Perfect! But as noted in the post on grizzlies, not someplace one should likely be during the hyperphagia season. My wife and I were there last year in late September and every rock in the meadow had been turned over, including some 200 pounders. And there are grizzlies in the Roots that I can personally attest to. We observed a sow and two yearling cubs at Globe Lake at a way too close range (and have photos to prove it). Globe Lake is just a little over a mile from Curly. The merits of Curly Creek aside, the Tobbaco Roots have a wealth of spetacular. In my opinion, only the remains of past mining and the resulting roads/motorized access detract. But there are a lot of areas where one can leave all that behind. I appreciate your great insights – thanks. I hope to explore more of the Tobacco Roots this summer.